» Grocery carts: a tech solution? Grocery carts: a tech solution? Resting place: A Fred Meyer cart has been parked in the brush at Waverly Cemetery for some time. 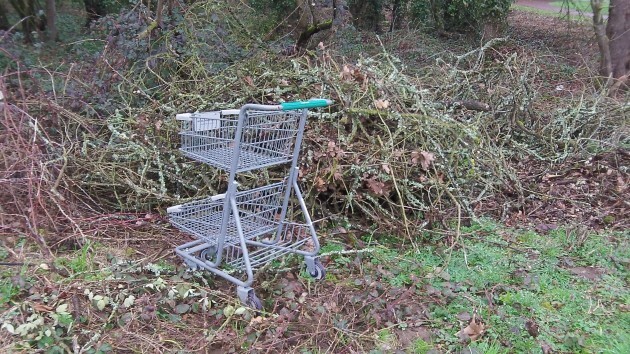 Some years ago Albany passed a city ordinance to put a stop to the nuisance of grocery carts being taken from stores and abandoned all over town. It’s an elaborate law, and as far as I can see it has done almost no good. Could there be a technological solution? Under the city law, carts are supposed to be labeled with the stores’ names and phone numbers. People are supposed to be able to call the stores to pick up errant carts. Or the city will pick them up and the stores can get them back for a $50 fee. But it hasn’t worked all that well. Grocery carts still show up in Periwinkle Creek and lots of other places where they don’t normally belong. Councilor Bill Coburn mentioned the problem at a recent city council meeting. He brought it up because somebody had complained to him. Well, if laws don’t work, maybe the answer lies in technology, maybe even from overseas. I’ve been reading a bike blog named “Town Mouse,” by Sally Hinchcliffe, who writes with an engaging mixture of wit and charm about life in rural Scotland, where she moved from London in 2008. In the archives of her blog, there’s a story about a particular grocery “trolley” she and her other half liked to use. It was better and special because, unlike all the others at that store, it was NOT equipped with a gizmo intended to keep the trolleys from being taken off the parking lot and being chucked into the nearest canal. If indeed these carts cost $200 + as I have heard, why don’t the stores come and pick them up when called? I have called more than once for carts in our neighborhood (2nd & Main) and no one picks them up. Maybe if the police started arresting people that STEAL carts the problem would disappear? I don’t think it’d take very many cases being ACTUALLY prosecuted before the word got out to NOT STEAL carts. The ordinance penalizing the stores makes about as much sense as fining a homeowner for having their property stolen and then thrown away, causing litter. This is just more evidence of how backward the regime running our city is. They blame and torment the victim instead of going after the people who actually cause the problem. Most of the people who run off with these carts are the homeless. They store their belongings in them and use them as if they owned them. When they break down they toss them into a nearby river or creek and go get another one. The city has – at least in part – helped to create this problem. They’ve made it far too easy for the homeless to find lodging at night and free space during the day – all while using stolen property. A little less effort in supporting their way of life would go a long way. I’d much rather see the police aggressively pursue the actual criminals in these matters. Fining them would do little – they don’t have much money – but confiscating their goods and cart would be a great start. Word would spread quickly about the loss of possesions and ease of transportation. We just had an article in the paper about the rise in stolen property. Stealing shopping carts is a crime too. Some jail time might be in order. How about our city council, instead of blaming the victim, instruct our Police to properly arrest and prosecute these criminals? Here’s the word on how those things work, from a reliable source: Shopping trolley devices — they have textured rubber grids on the sidewalks of the supermarket areas with raised bumps or “dots.” The dots are spaced so that they trip a brake lever in between the (dual) wheels on the trolley casters. I would have to assume they can’t be too hard to reset, and then you’d be good to trot away with one so long as you didn’t encounter more grids of dots.